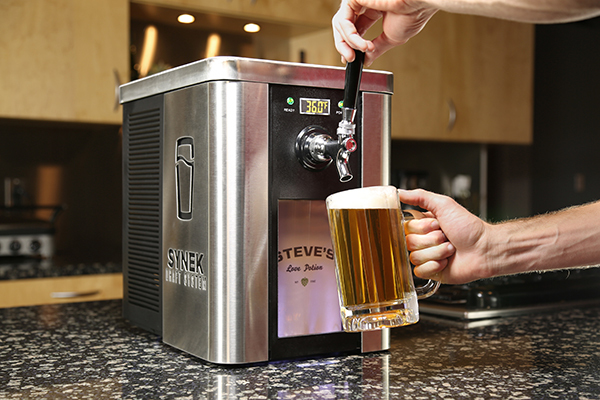 SYNEK: Can This New Beer Dispenser System Replace the Growler? Few things make a beer nerd happier than a growler full of fresh beer from his or her local brewery. The problem is, if you pick up that growler on Friday after work and enjoy a couple of pints from it that night, the clock is ticking – because what’s left is more than likely going to go bad by Sunday. A stock market analyst named Steve Young believes he has an answer in a product called SYNEK. It replaces the traditional growler as a beer vessel with a system that dispenses beer from cartridges that are specially designed to keep your brew fresh. 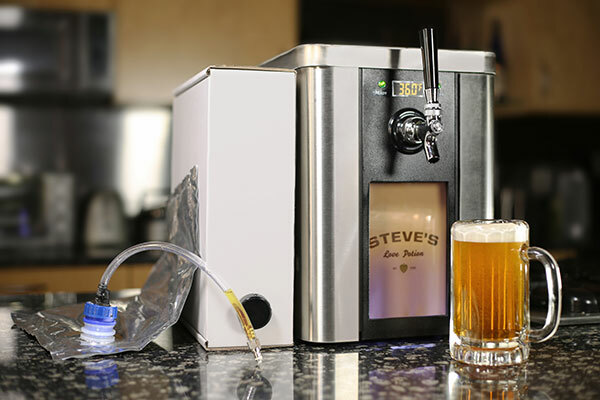 It’s almost like a Keurig coffee dispenser for beer – you can set the self-refrigerated dispenser on your kitchen counter and simply restock it with one-gallon cartridges that can be filled with literally any kind of beer. Young felt there simply is no good method of packaging beer currently, and backed up this notion by interviewing countless brewers. Cans and bottles limit what a brewer can distribute, and kegs are similarly restrictive. We’ve already addressed the inherent problem with a growler, and Young believes SYNEK is a universal answer. The press kit attributes this quote to a former Anheuser Busch Executive in a private review of the SYNEK system. This sounds like the kind of thing that could leave someone sleeping with the fishes. But it also sounds like a pretty fantastic contraption if it indeed works as claimed. Apparently, Young has a patent pending on a device that will make it possible to fill the cartridges (which actually contain a bag specially made to store the beer) straight from any keg, tap, or holding tank. So, that small batch beer that never gets bottled could theoretically go into a SYNEK cartridge for you to take home – and it would last until you’re finished drinking it. Also, for home brewers (and small breweries and home drinkers), it creates a situation where you don’t have to meticulously and continuously wash bottles. On the SYNEK team are head engineer Jeff Macler, who the press kit identifies as “the best flexible packaging engineer in the world,” and someone who has four times more patents filed than Anheuser Busch-InBev. Macler does most of the packaging design/testing for large companies like Hormel, Sara Lee, and others. There’s also mechanical engineer Mike Young, who is an electrophysicist at Boeing, designing top secret parts and systems for defense projects. Of course, one of my first questions was: What are you going to tell the hipster beer snob who insists the beer tastes different from a SYNEK dispenser (and we all know that’s going to happen)? “Our chief engineer, who was previously in charge of quality control on a navy nuclear submarine, has run extensive tests both on the molecular level and through blind taste tests to make sure that the beer is unaltered,” Stoddard said. Hey, if these guys think they’ve developed something to combat hipster snobbery as well as bring us fresh beer, then we probably should be taking note. But it’s designed to help the little guy, first and foremost, he added. Could SYNEK spell the end of the traditional growler? We’ll see in a few weeks, as the Kickstarter campaign hopes to have $250,000 raised by late July. Heck, if it really means fresher beer that actually lasts as long as you need it to, as well as a leg up for the small craft brewers, I’d be happy to turn my old growlers into vases or water jugs.